A sweet little orphan comes to live in an ancient, easily-flooded English mansion (in the first chapter, he reaches his front door by boat) that is already populated by a magical elderly lady and about thirty-seven ghosts. The prose is, somehow, fully equal to the awesomeness of the conception. Like Aunt Joan, these books never talked down. 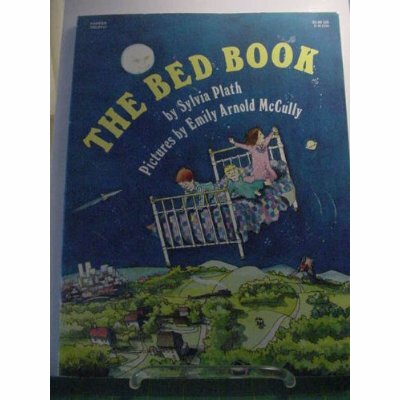 Another children’s book, this one being a sort of rhymed guide to the large variety of armed, mechanized, food-producing, paint-resistant, animal-shelter-providing, and/or rocket-powered beds that a teeming world provides for the delectation of those children insufficiently challenged by “a white little/tucked in tight little/nighty night little/turn out the light little/Bed.” Very evidently the only reckonable work ever produced by the otherwise-tedious Ms. Plath, this children’s masterpiece commanded the rapt attention of my sister and me from an early age. It is out of print now, because the world is a moron. So many that I don’t remember who wrote them all: I just remember the mineral-richness of the soil they provided for my imagination to snack on. I didn’t read this one, actually. It seemed too transparent an attempt to get me interested in Ancient Egypt. I have, as an uncle, made the same mistake once or thrice: I don’t think Graeme really realizes how awesome it was of me to get him Farenheit 451 this year. But that same Christmas’s other present, a board game called By Jove!, did nothing to stunt my interest in Greco-Roman mythology, and from this I learned another lesson in uncling: always have more than one cool, educational present. My father is an unclassifiable polymathic genius who cleans buildings late at night. My mother, when life leaves her two spare nickels’ worth of attention to rub together, likes to read the Victorians. There was never any chance that they, or my sister (who as a teenager designed her own funky outfits to go dancing in, like Molly Ringwald in Pretty in Pink, and wrote poetry) were going to allow me to grow up in an imagination-deprived environment: this even though they allied themselves with a version of Christianity whose loudest representatives seem to me most marked, not by bad politics or sticky-uppy-hair, but fear of the imagination. But in any case, an aunt or an uncle’s job, as I see it, is to reinforce what the family is trying to do for a child’s mind … from a slightly skewed angle. That’s what Joan did, and that’s what I try to do. On her death it seems appropriate to say that I learned from the best. Very nicely done. Joan would have really appreciated that last line. BTW- in the first place, my unimaginative Christianity has a lot in common with Bunyan, Milton, and Lewis. In the second place, 90% of ALL people are unimaginative, whether Evangelical or not. Still, it was nice. Thank you. Ah, yes. I thought about editing that line out for decorum’s sake. I decided to leave it in as a sort of backhanded compliment: “They’re so great, it mitigated the effects of Baptistry …” See, even when I’m mean, I’m nice. Or something. By the way, it’s fundamentalism that I consider unimaginative. Not Christianity, and certainly not you. And thanks for reading. Of course. I remember your Aunt Joan; and I remember reading The Bed Book at your house. That’s a wonderful tribute, and a pertinent encouragement to any parent’s sibling. She was clearly quite the woman. That is a very appropriate tribute to Joan. We were friends; I knew her many years ago, just learned of her death, and was looking up information and came across your website. She and I went to college together, worked on the school newspaper, and later shared an apartment in Scranton while working at our alma mater. We went to the Shakespeare Festival in Stratford, Ontario, together more than once, but a long time ago. My condolences. She was a reader, indeed, and I’m glad that you have books from her. I lost touch with her in the last several years; she didn’t respond to cards or letters. Still, I feel her absence. Aunt Diane and RoseLee, thanks for reading. RoseLee, I remember her mentioning you on multiple occasions, so she definitely hadn’t forgotten you. The melancholy truth is that she wasn’t answering anybody’s mail. I don’t think we’ll ever have a clear handle on why. Phil – Thanks for a challenging yet comforting summation of the job of an aunt or an uncle. One of my aunts was my high school Spanish teacher, and we are still close, despite my having done nothing with my college Spanish degree but converse with my neighbors. Another aunt is my dental hygienist and – love the irony – hosts our family’s annual Christmas cookie baking day and has provided several recipes we make throughout the year. And my younger sister, an aunt herself, is carrying out her familial role with aplomb, choosing literary and otherwise creativity-inspiring gifts for her nephews near and far. It’s not every suburban little boy whose aunt sends him an Amish-style straw farm hat from the Mennonite mall… nor who wears the thing as a sunhat for years until it comes apart at the seams and is fit only for a snowman. Thanks again for the aunt-ly tribute. You hit some universals with this post.